On the left the slopes of High Stile plunge down to Buttermere. In the distance is Carling Knott, with Mellbreak overlooking Crummock Water. 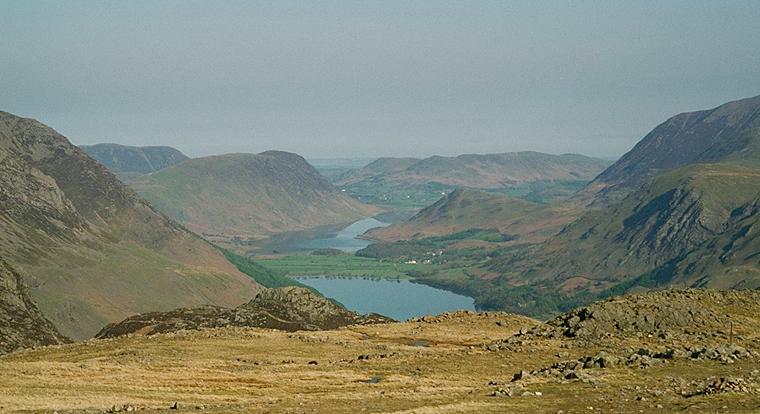 To the right of Crummuck is a lowly Rannerdale Knotts with the group of Darling Fell, Low Fell, Fellbarrow etc. beyond. Grasmoor is on the extreme right behind Goat Crag on the slopes of Robinson. The crag in the foreground is Haystacks. Smaller version of this picture.